Newberry College partners with Lexington Medical Center for the education and clinical instruction of our nursing students. 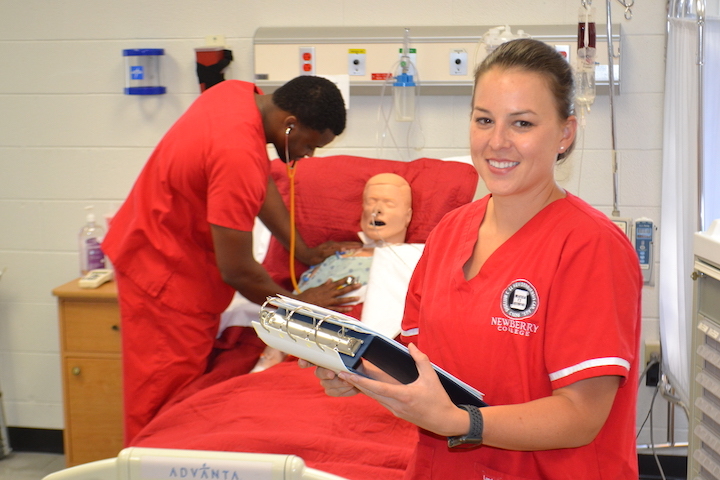 The Department of Nursing at Newberry College is dedicated to providing a baccalaureate education in the Christian tradition through collaboration with students in a dynamic learning environment. Nurses comprise the largest group of healthcare providers in the country and are consistently viewed by the public as the most trustworthy of professionals. Nurses prepared at the baccalaureate degree level provide care in both traditional (hospitals, nursing homes, clinics, etc.) and non-traditional (homes, communities, jails, occupational health, etc.) settings. Nursing alumni from Newberry College are nurses not only in the Carolinas, Georgia, and Florida, but also in California, Hawaii, and Utah. Some have continued their education and now are nurse practitioners. The Department of Nursing offers two pathways for earning a Bachelor of Science in Nursing (BSN) degree. The BSN Prelicensure Track is for students who want to become nurses. The RN-to-BSN Completion Track is for registered nurses (RNs) who already have an associate degree or a diploma in nursing who want to take the necessary courses to earn their BSN degree. The Nursing program is nationally accredited by the Commission on Collegiate Nursing Education (CCNE),655 K Street NW, Suite 750, Washington, DC 20001, (202) 887-6791. The BSN Prelicensure Track at Newberry College is a four-year degree program. Students take foundation courses during their first year years of study at Newberry College followed by two years of upper division nursing courses resulting in a Bachelor of Science in Nursing degree. The program is offered in partnership with Lexington Medical Center, so students have a variety of learning experiences with expert nurses both in the classroom and in the clinical setting. The Nursing program is approved by the State Board of Nursing for South Carolina, so graduates are eligible to take the licensing examination to become registered nurses. Provide culturally competent care for patients, families, groups, and populations across the health-illness continuum and across the lifespan. Utilize the Neuman Systems Model to provide holistic nursing care in a variety of settings within a complex and dynamic healthcare system. Design, coordinate, and manage nursing care that integrates a liberal education with nursing theory and research, clinical expertise, and patient values to assist patients in reaching their optimum level of wellness. Incorporate professional standards, critical thinking, patient advocacy, safety, compassion and leadership into their nursing practice. Engage in ongoing professional development, life-long learning, and service in society. 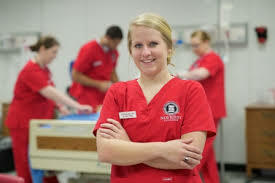 Admission to Newberry College and successful completion of prerequisite course work does not guarantee admission to the upper division Nursing major. Admission to the Nursing major as a junior student is a separate process that occurs in the spring of the sophomore year and is based on the student’s ability to compete academically with other applicants. The number of students admitted to the Nursing major in any given year is limited to those who can be accommodated, given available resources and within the regulations set forth by the State Board of Nursing for South Carolina. Any Newberry College student may declare Prenursing as their initial program of study either upon admission to the College or after admission to the College. This declaration will mark their admission to the Prenursing (Lower Division) curriculum. Upon declaring their intent to the College, students must schedule an appointment with a nursing faculty advisor. Have completed or be enrolled in a minimum of 64 credit hours of coursework applicable to the degree. Have a minimum C grade in each of the 11 required Prenursing required courses listed below. Have a minimum Prenursing GPA of 3.0 (calculated using the 11 Prenursing required courses, regardless of where they were taken) AND a minimum Science GPA of 3.0 (caclulated on the grades for BIO 212, BIO 215, BIO 216 and CHE 105) at the time of application to the Nursing program and at the point when the student begins the Nursing program. Have an overall score of “Proficient” or higher on the ATI-TEAS exam, with a minimum science sub-socre of 50. In the event that seats are available after all qualified, currently enrolled Newberry College students have been seated, direct transfer students from other institutions will be considered for admission to the remaining seats in the Nursing major. To be considered, prospective direct transfer students must contact the Department of Nursing by May 1 for the for the following fall semester or by October 15 for the following spring semester. Direct transfer student will not be admitted to the Nursing major for the semester until all qualified Newberry College students have been admitted. All students admitted to the prelicensure Nursing major must complete all “Professional Screening” requirements by the July 31 or January 5 deadline, regardless of date of admission to the Nursing major. Maintain a Newberry College cumulative GPA of 2.0 (not rounded) assessed each semester including summers. Complete all required Nursing (NUR) courses in sequence with a grade of “C” or above. Complete and return all required “Professional Screening” documentation covering the complete academic year. For students with a fall program start (August 1 to April 30) return documentation by July 31; for students with a spring program start (January 6 to December 5) return documentation by January 5 each year. Complete required remediation based on standardized achievement tests included with selected Nursing (NUR) courses. Maintain enrollment at Newberry College during both semesters of the academic year. Any student who fails to meet the progression requirements listed above other than the repeat policy will be listed internally as “Out-of-Sequence” and can join an upcoming Nursing class on a space available basis once eligibility for progression is reestablished. Students already progressing in a particular class have priority for space in that class and must be registered before an out-of-sequence student is allowed a seat in the upcoming Nursing class. In the event there is insufficient space available in an upcoming class, the student who is out-of-sequence is obliged to make alternate academic decisions. Complete all current Core, Graduation and GPA requirements as detailed in the Newberry College Course Catalog. Complete all required Prenursing and Nursing (NUR) courses with a minimum grade of “C” in each course. Complete all required Nursing (NUR) courses within three (3) years prior to graduation. Complete a comprehensive standardized nursing content examination at a level predictive of NCLEX-RN success as part of NUR 420. The prelicensure nursing curriculum currently consists of 127 total credit hours, including 57 credit hours of required NUR courses all taken in the junior and senior years at Newberry College, 3-4 hours in Human Genetics, 38-39 credit hours of required prenursing coursework (some courses fulfill Newberry College Core requirements), plus courses that fulfill the Newberry College Core requirement. To meet Program Learning Outcomes and to provide access to technology, students taking Nursing (NUR) courses are required to equip themselves with a laptop computer (not a MAC nor a tablet) with wireless network capability meeting or exceeding the recommended requirements specified under the Technology Tab in Wolf Den. Laptops must have the basic software functionality of Microsoft Word, PowerPoint, and Excel. This functionality is provided free of charge in Windows 365, which all students can access through the Technology Tab in Wolf Den. Please note that Apple products are not alwasy compatible in all instances.